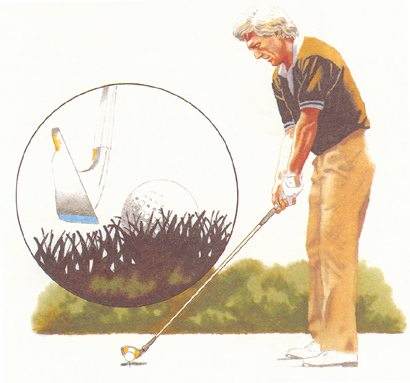 Early in my golf life I adopted Jack Nicklaus's technique of addressing the ball with the clubhead held just above the turf rather than resting on it. I like the idea for two big reasons. First, it keeps my grip pressure constant. As you stand over a shot, you have a natural tendency to regrip, and each time your hands shift on the club - even a fraction - it has a major effect on the outcome of the shot. Second, it promotes a very smooth one-piece takeaway with the clubhead flowing straight from the ball. This is particularly true with the driver; there will be no tendency to snap the clubhead up quickly and vertically as there can be when the club is soled. It's also a valuable technique when your ball is perched in a precarious lie in the rough. Soling the club in such a lie can set off a chain reaction which could move the ball, incurring a penalty. By hovering the club, you not only eliminate that risk, you reduce the tendency to snag the clubface in the grass, both on the takeaway and on the way down to the ball. I must admit that not many players - pro or amateur - hover the club at address, probably because this is not an easy method to master. But if you can learn it, you'll give yourself some big advantages over the vast majority of golfers.